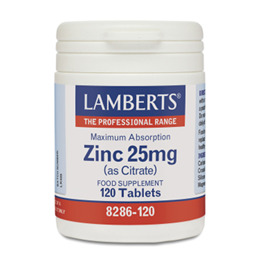 Lamberts Maximum Absorption Zinc as the citrate form is known to be readily absorbed. These small easy to swallow tablets are made in the UK to pharmaceutical GMP standards. Zinc is an essential nutrient and contributes to the normal function of the immune system, normal fertility and reproduction and the maintenance of normal hair, skin and nails. Each tablet provides a full 25mg of zinc per tablet, presented in the citrate form. This strength of zinc supplement is for short term use to correct deficiencies quickly. Calcium Carbonate, Zinc Citrate, Crosslinked Cellulose Gum, Silicon Dioxide, Stearic Acid, Magnesium Sterate. Below are reviews of LAMBERTS Maximum Absorption Zinc as Citrate-120 Tablets by bodykind customers. If you have tried this product we'd love to hear what you think so please leave a review. This product is excellent for the immune system which is high priority for me. 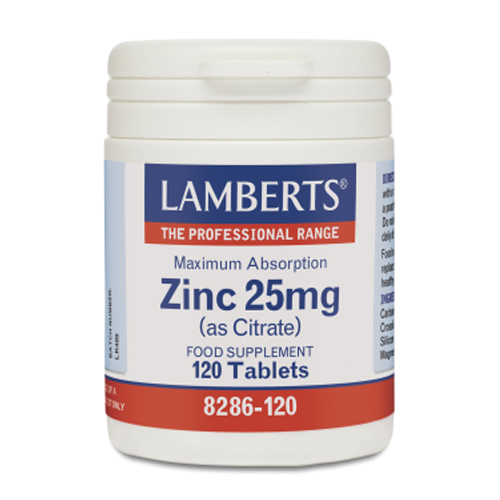 Lamberts Maximum Absorption Zinc is an ideal supplement for long term use as the citrate form is known to be readily absorbed. These small easy to swallow tablets are made in the UK to pharmaceutical GMP standards.